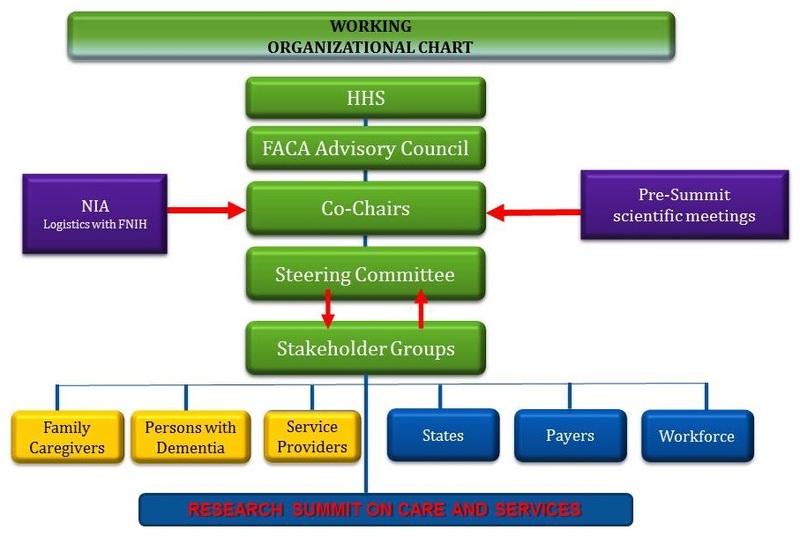 The goal of the Research Summit on Dementia Care was to identify what we know and what we need to know to accelerate the development, evaluation, translation, implementation, and scaling up of comprehensive care, services, and supports for persons with dementia, families, and other caregivers. The Summit was focused on research that is needed to improve quality of care and outcomes across care settings, including quality of life and the lived experience of persons with dementia and their caregivers. Stakeholder groups were formed to ensure that many perspectives would be reflected in the Summit agenda and recommendations. After the December 2015 meeting at AARP, Summit topics continued to develop through Summit co-chair and Steering Committee discussions. Session, plenary, and cross-cutting topics for the Summit agenda were decided between April 2016 and April 2017. The Summit agenda was largely decided by the end of May 2017 after it was reviewed by the Steering Committee, cross-cutting chairs, and session co-chairs. The Steering Committee provided comments and feedback on all agenda topics, and Summit co-chairs made final agenda decisions. Cross-cutting chairs helped identify Summit speakers on technology, diversity, women's issues, and etiology of dementia. The large pool of co-chairs, speakers, and cross-cutting chairs came from nominations made by members of the Summit Steering Committee and other stakeholders. Session co-chairs received a letter confirming their participation. Summit co-chairs conducted phone calls with the session co-chairs to discuss possible subtopics for each session. Develop each session with the speakers and panelists. To identify research recommendations in advance of the Summit. Before, during, and after the Summit to ensure that input from Summit participants was incorporated into the recommendations. Review all recommendations and finalize a list of five to eight strong recommendations. Participate in Summit as subject area speakers, if desired. The cross-cutting chairs helped identify possible Summit speakers on technology, diversity, women's issues, and etiology of dementia. The technology, diversity, and women's issues cross-cutting chairs also submitted research recommendations. The cross-cutting chair for etiology submitted comments on nomenclature in her session and on the ASPE website.